Today I completed one year of being on my own. In 2004, after graduating from college and doing brief experiment with a startup I came to Pune, looking for a job. I failed clearing the interviews of many MNCs. In the last two and a half years of my college I spent most of my time learning Linux and Computer networks. So, I decided to narrow down my search where there is requirement of some Linux Admin work and after giving my first interview, I got the job. Anyways coming forward, I do had some plans after leaving my full time job but didn’t know what coming next. As last time Linux helped again but this time in the form of The Linux Foundation. I got an assignment from The Linux Foundation to build a self paced course on “Cloud Infrastructure Technologies”, which got launched in June’16. Between Dec’15 – March’16 months I also gave free containers(Docker) workshops in Bangalore, Pune, Chennai, Hyderabad and Kolkatta. At the same time I gave some paid workshops as well. Within a month after leaving my job I realised how easy it be an employee than your own boss. One has to manage his/her time, next month’s pay check, family, health and so on without loosing the cool. After going through on my own I started to respect entrepreneurs, self employed, my local vendors, auto rickshaw drivers etc more. Less sleep, lot of work took a toll on my body and I got struck with Bell’s Palsy in Jan’16. It was very scary to go under MRI in the middle of nigh for the checkup. It took me few months to recover. This definitely effected my work and I had to re-organise myself. As everyone I thought of getting some interns and employees but that did not work either. I spent my time, energy and money to make them upto speed but did not succeed either. It was difficult to part ways with some of them but I am happy that we did that in good terms. It was a good experience which I think can come only with few mistake. I learnt one very important lesson “Never hire a full-time until I am 100% satisfied”. The formal registration of the company did not happen until May 2016. It is one marathon task as well. Working with Charted Account to get all documentation is not fun but it has to be done anyway. For registration I had to also give a company name. I spent good amount of time think about it. I was looking for some inspiration/help which I got from Ranga Shankara, a theatre in Bangalore and very near to my office. On my way to back from daily visit to a coffee shop I saw the board for theatre festival “Youth Yuga”. In hindi “Yuga” means “Era”, which made me think that is an era of cloud computing. So why not name my company “CloudYuga”. I took the “.guru” domain as in next year or two I would focusing on trainings. Till Dec’15 to July’16 we worked from Bangalore Alpha Lab and then moved to our own office. It was fun to see the our own office taking shape. Throughout the year I was engaged with Docker Community, which helped me both professionally and psychologically. I became part of Docker Captain’s program, which was a good confidence booster. In Bangalore I organised Docker meetups, which kept me well connected with local community. On my own I attended different international conferences DevConf’16, DockerCon’16 and LinuxCon/ContainerCon’16 & spoke in two of them . When I started last year I told my family that lets see for 6 months and if things does not work out then I can go back to full time again. Its been year and I have things in pipeline for next 6 months, which is good. My family supported me very well, specially my wife Kanika who also joined to work with me part time since last few months. Till now my focus has been training than consulting, which I believe would continue for some time. I see good amount skill gap in adopting container technologies.. good for me !!. Over the year I got some corporate clients for trainings which I think would continue to grow. 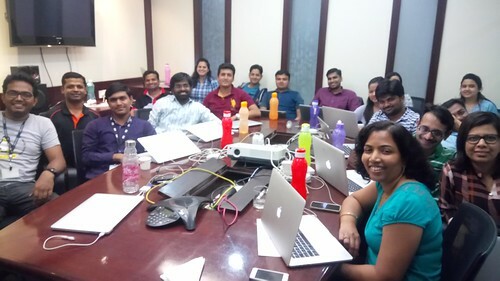 Here is the group photo of the container (Docker) training I delivered today in Pune. There are more good people in the world than we think. They are willing to help you. Reach out to people with helping hand. Be true to yourself and things would fall in place. Its been a fun ride with lots of new experienced. Lets see how far we can go !! Thank you for sharing your journey with us and keep it up! Congratulations and All the best wishes to you, neependra !!! Congrats Neependra and good reading. I see you have the winning streaks in you : conviction, resilience and humility ( and of course domain knowledge ) . Keep going – you will certain succeed in your endeavor. Cheers. Thomas. Neeps, so happy for u bro.. I liked that statement too much “Be true to yourself”. Keep going buddy.. Lets have some chat on Mesos n Kubernetes when we meet next.